We take a lot of pride in our centres and you’ll see from yourself the time and effort we have invested in them. With 5 Centre’s covering the UK and a Control centre focusing on PLC training in the north we work hard to supply the very best training as close to you as possible. 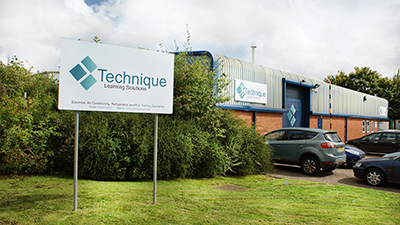 Our ever-expanding business and centres shows how committed we are to the very best professional training and we don’t stop there. With our comfortable lounge area fitted with plenty of sofas, chairs, dining areas, vending machines, tool promotions, magazines and a large TV for your entertainment. Our classrooms are kitted out with the latest projector screens, heating/cooling systems and all the technical gear you will need to learn whichever course you learn on your visit. Since the formation of Technique Learning Solutions, on-going re-investment and diversity has demonstrated our commitment to our clients, staff and the future. This can be evidenced by viewing our own facility in Derbyshire, which sets new standards in quality and training our competitors can only dream of. We have classrooms, workshops and an IT suite making use of an array of test rigs, enabling candidate’s virtual “real life” situations. Not to mention dining and relaxation areas. Whether you are a sole trader, from a blue chip company, unemployed, or retraining… we will have the appropriate course for you. “Our motivation is to ensure that all our candidates will obtain the highest level of training and attain nationally recognized qualifications, giving the ability to exceed national standards and contribute to the professionalism of the industry”. When sourcing training providers, I strongly recommend that you look closely at what facilities and training options they offer. Companies who don’t include pictures or detailed information about their centres, usually suggests they do not have dedicated student orientated classrooms and workshops to facilitate sound learning. If you can, visit..
Our mission is to provide all our candidates with the very best usable knowledge at a fair price. We pride ourselves in our extensive range of up to date training equipment, enabling the candidate to work ‘individually’ in ‘true to life’ situations. We take a lot of pride in our centres and you’ll see from yourself the time and effort we have invested in them. With 5 Centre’s covering the UK and a Control centre focusing on PLC training in the north we work hard to supply the very best training as close to you as possible. Our ever expanding business and centre’s shows how committed we are to the very best professional training and we don’t stop there. With our comfortable lounge area fitted with plenty of sofas, chairs, dining areas, vending machines, tool promotions, magazines and a large TV for your entertainment. Our classrooms are kitted out with the latest projector screens, heating/cooling systems and all the technical gear you will need to learn whichever course you learn on your visit.